Enterprises are full of consumers, too, and those consumers are enjoying more productivity options than ever. Box, one of the companies facilitating such productivity, has launched its OneCloud set of integrations to Android, after launching for iOS at the end of March. 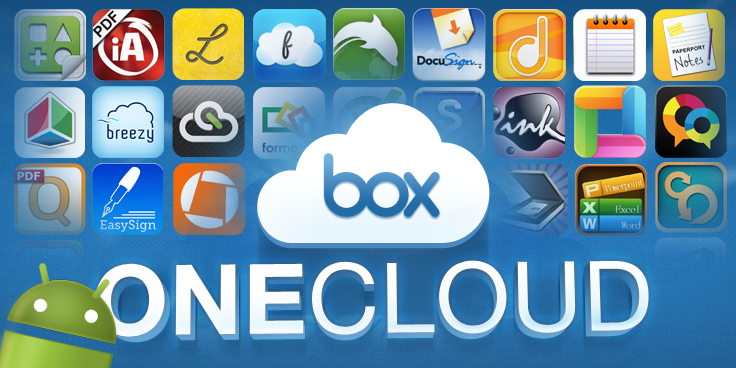 What OneCloud does is help people integrate the productivity apps that they prefer to use with Box’s cloud services. Downloading a file, annotating it, and then sending it back to the cloud is no easy task, and this is something that Box has perfected with OneCloud, no matter what app you prefer to use. Box’s VP of Platform, Chris Yeh, called OneCloud the “first mobile cloud for the enterprise.” One of the top requests from users for this service was to bring it to Android, and now it’s here. Box OneCloud offers the most complete suite of productivity tools for today’s post-PC enterprise. The way people work is radically changing. With Box, IT departments and the mobile workforce now have a unified platform to securely manage applications and content from any device or location. When I spoke to Yeh last week, he shared some interesting details about how Box is progressing, and thriving, as a company fully focused on enterprise. As of now, Box has 500 people at the company, and has 120K+ businesses on the service, with 11M+ users. Currently, 40% of its users are accessing the service via mobile devices, so it makes complete sense to bring the same offerings to Android. The company is currently looking at Windows 8, as it could really leverage to newly announced Microsoft Surface. • Round-trip integrations: provides a seamless way for you to open Box files in partner apps and save them back to Box. Whats happened in mobile is really really interesting and game changing, and Box is doing a great job converting on it. iAnnotate lets people share notes amongst colleagues and classmates. The service has a half million paying customers, including people at Fortune 500 companies and students at Harvard. Bhatt tells me that people are using the app to “work a lot smarter” and preserve notes. He tells me that TV shows like Modern Family, CSI and House have used iAnnotate for script reviews. The gallery of apps in the OneCloud version on iOS is currently accessed by 25% of its users, so its safe to say that the company will see the same type of usage from its new influx of Android folks. The key is editing documents in an app and sharing it with an another app. Both of these OS’ have their quirks when you try to do that. iOS takes the file as an object and moves into the other app, but doesn’t let you put it back where you found it. We Had to do a lot of work with 3rd party apps. On Android there’s more of a natural filesystem. There’s a notion of intent, but securing the roundtrip is more difficult. For developers who want to leverage OneCloud, Box is also shipping a new SDK which when implemented, runs behind the scenes for users, keeping files encrypted and getting rid of versioning issues of the past when editing documents. When it comes to competition, Yeh says its a “hugely crowded space”, but provides Box with serious “legitimacy.” While Box has been working on cloud issues for years, the company can focus on pushing out really innovative things like OneCloud, while the rest of the pack is still focusing on getting started. For example, Google Drive hasn’t moved out of its infancy phase since launching, although we’re hearing that at Google I/O, that might change.